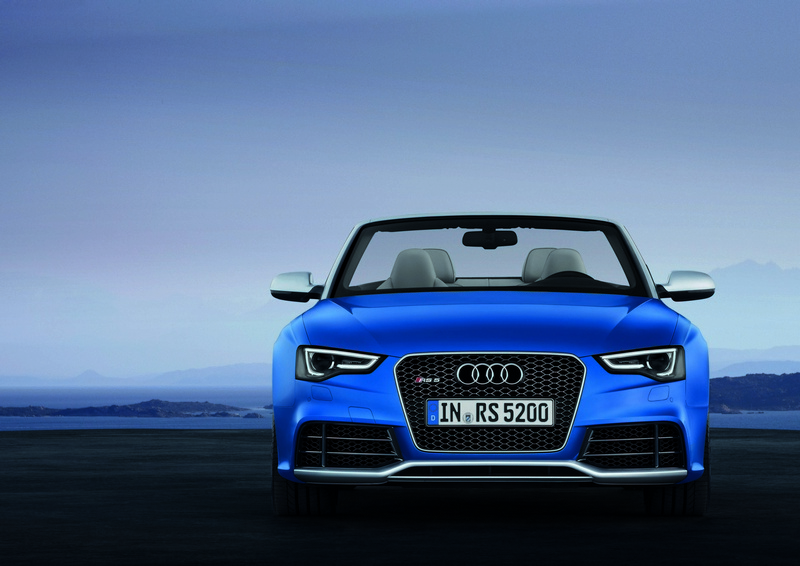 Dynamic performance where the sky’s the limit – Audi introduces the RS 5 Cabriolet. The four-seat convertible with a cloth soft top entices with a unique combination of elegance and power. Its 4.2 FSI, a high-revving naturally aspirated V8 engine, outputs 331 kW (450 hp). It accelerates the high-performance sports car from zero to 100 km/h (62.14 mph) in 4.9 seconds. In the RS 5 Cabriolet, Audi dynamics takes on an especially beautiful form in the car’s flowing side profile with perfectly balanced proportions and sharp details. A frame in matt aluminum look surrounds the hexagonal single-frame grille; its honeycomb grille insert that sports an RS 5 logo shines in anthracite. Wedge-shaped headlights with wave-like lower edges illuminate with xenon plus lamps and LED strips that form the daytime running lights. Large air intakes are embedded in the distinctively shaped front apron whose ends run out into splitter edges. Sill add-ons and wheel housing extensions dominate the car’s appearance in side profile; the tornado line that defines the shoulder of the RS 5 Cabriolet was drawn to look especially sharp. The door mirror housings have an aluminum look, while the surface of the windshield frame and the decorative trim strips of the window channels and the soft top box cover are made of matt anodized aluminum. The lightweight textile roof of the RS 5 Cabriolet spans over the generously proportioned interior space like a low curved dome; a special foam layer in the roof delivers high acoustic comfort. At the press of a button, the soft top opens and closes fully automatically in 15 seconds and 17 seconds respectively – even when driving at speeds of up to 50 km/h (31.07 mph). When open, it hardly affects the size of the spacious luggage compartment – it only requires 60 liters (2.12 cu ft) of its 380 liters (13.42 cu ft) total volume. The split rear seatbacks can be folded over individually, and a load-through hatch from the trunk to the rear seating area improves variability. Special reinforcements contribute to the convertible body’s high rigidity, and aluminum front fenders compensate for some of the added weight of the reinforcements. Elegant LED light strips illuminate in the taillights, which operate without any conventional incandescent lamps. Like the lights, the rear bumper was also redesigned; its diffuser is now much higher, and a honeycomb screen insert encloses the two large elliptical tailpipes of the exhaust system. On the trunk lid there is a subtle matt carbon spoiler lip for more downforce; it may be painted in the exterior color as an option. The Audi RS 5 Cabriolet measures 4,649 mm (15.25 ft) long, 1,860 mm (6.10 ft) wide and 1,380 mm (4.53 ft) high, and its wheelbase is 2,751 mm (9.03 ft). Eight exterior colors are available – a monochrome color, four metallic and pearl effect colors and three crystal effect paints. The soft top is available in black, gray, red or brown. As options, Audi can install a styling package in matt aluminum as well as an engine compartment design package that uses carbon fiber-reinforced polymer (CFRP) materials. The car’s drag coefficient is 0.34; underbody panels make a significant contribution towards aerodynamic refinement. A typical RS 5 highlight is its three-spoke steering wheel with flat-bottomed rim that is trimmed in perforated leather. The multifunction keys are intuitive, as are all other controls in the RS 5 Cabriolet. The terminal of the optional MMI navigation plus system, for example, only requires six permanent keys for the main menus, and just a single button control suffices for Audi drive select. White numerals on black dials provide a strong contrast and are easy to read. Sport-oriented drivers will find a lap timer for lap times and an oil temperature gauge in the driver information system. The sport seats have power adjustments, high side panels for optimal lateral support, integrated head restraints, a lumbar support and a pull-out thigh support. They are upholstered in a combination of leather and Alcantara or in the optional black or lunar silver Fine Nappa leather. All leather types are pigmented to inhibit heating by sunlight. Seat alternatives are manually adjustable bucket seats or climate-controlled comfort seats with a ventilation feature. The interior of the Audi RS 5 Cabriolet is styled in black, and the inner soft top liner can be ordered in the optional color star silver. Fine chrome highlights, understated high-gloss black trim and carbon inlays underscore the car’s dynamic appearance. Upon request, Audi can deliver the inlays in Aluminum Race, piano finish black, matt brushed aluminum or stainless steel mesh at no additional cost. There are RS logos on the backs of the seats, the aluminum inlays in the door sill plates, the steering wheel, the tachometer and the gear selector grip of the seven-speed S tronic. The inside door handles consist of two slender ribs, and the pedals and many other controls glisten in aluminum look. The Audi exclusive program offers many other customizing options. Propulsive power for the RS 5 Cabriolet is supplied by a high-revving, naturally aspirated V8 engine with FSI direct injection. From its 4,163 cc of engine displacement, it outputs 331 kW (450 hp) at 8,250 rpm and produces a maximum torque of 430 Nm (317.15 lb-ft) between 4,000 and 6,000 rpm. The 4.2 FSI with red painted cylinder head covers that is manually assembled in the Hungarian plant in GyQr achieves a specific power output of 79.5 kW (108.1 hp) per liter engine displacement; each hp only needs to move 4.267 kg (9.41 lb) of vehicle weight. The long-stroke engine with its aluminum crankcase breathes freely; flaps in the exhaust tailpipes vary the sonorous acoustic backdrop. As an option, Audi can deliver a sport exhaust system with black tailpipe trim. The Audi RS 5 Cabriolet rockets from a standstill to 100 km/h (62.14 mph) in 4.9 seconds. The car’s top speed is limited to 250 km/h (155.34 mph); at customer request, Audi can boost this to 280 km/h (173.98 mph). The powerful V8 has a combined fuel consumption of 10.9 l/100 km (21.58 US mpg). Its cylinder liners and chain drive are optimized for minimal friction, and the oil pump is only driven as needed. Dual-clutch transmissions like the seven-speed S tronic of the RS 5 Cabriolet are distinguished by a high level of efficiency, which is further improved in this model by the long ratio of the highest gear. Shifts are performed so quickly and smoothly by alternating the clutches that they are hardly perceptible. The driver can have the seven-speed S tronic shift automatically in the D or S program, or he/she can manually shift with the gearshift lever or the paddles on the steering wheel. The Launch Control function is a useful drive-off assistant for the race course. It enables an optimal start by letting out the clutch at an ideal drive-off engine speed. 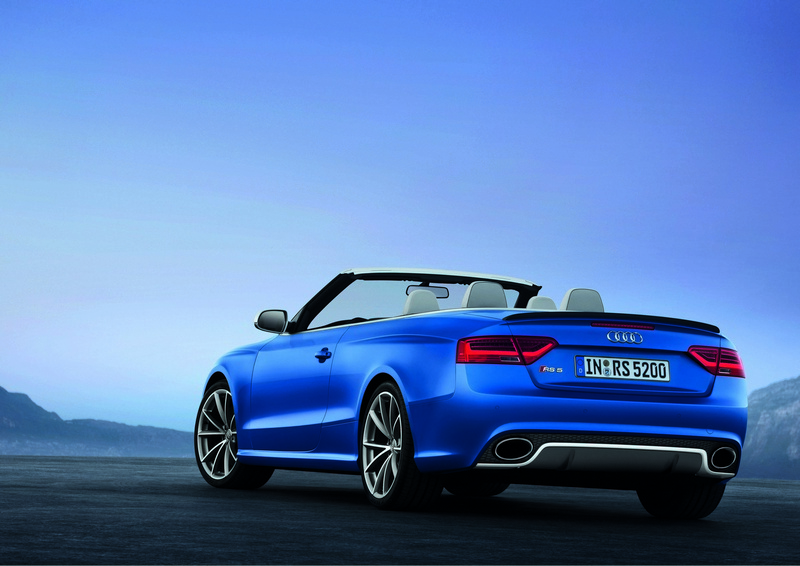 The quattro permanent all-wheel drive system gives the RS 5 Cabriolet a decisive advantage in traction and stability. Its technological centerpiece, the crown-gear center differential, is lightweight and compact. In normal driving operation, it distributes torque between the front and rear axles at a 40:60 ratio; if necessary, it can direct up to 70 percent to the front or a maximum of 85 percent to the rear. Torque vectoring – an intelligent software solution – completes the center differential’s work tasks. If a wheel at the inside of a curve begins to lose its grip when cornering at speed, it is braked slightly before any slip occurs – this keeps the RS 5 Cabriolet neutral for an exceptionally long time in extreme driving conditions. As an option, Audi can install a sport differential that actively distributes power between the rear wheels via two superposition gears. A perfect supplement to the quattro drivetrain, it presses the RS 5 Cabriolet into the curve at the handling limits, counteracting any tendency to oversteer or understeer right from the outset. The chassis of the four-seat convertible exhibits a high level of technical complexity. Many components of the five-link front suspension and the self-tracking trapezoidal-link rear suspension are made of aluminum. The speed-dependent power steering system utilizes an electromechanical drive unit; it provides direct and sensitive steering feedback and is highly efficient. The body is 20 mm (0.79 in) lower than that of the Audi A5 Cabriolet; its mounts are stiffer, and its anti-roll bars are larger and stronger. The standard wheels are forged aluminum wheels in machine-polished ten-spoke design, size 9 J x 19 with 265/35 tires; 20-inch wheels in three attractive designs with tires in 275/30 format are available as options. The brake system employs internally ventilated and perforated discs in a weight-saving wave design; the front discs are 365 mm (14.37 in) in diameter. The wave-shaped outer contour of the friction rings reduces unsprung mass by a total of about three kilograms (6.61 lb). Pins are used to join the discs to the aluminum brake pots – a concept adopted from motorsport. The brake calipers are painted black; the front brakes operate with eight pistons each. The ESC stabilization system has a Sport mode and can also be completely deactivated. Audi can deliver the car with carbon fiber-reinforced ceramic front discs and six-piston calipers as an option. 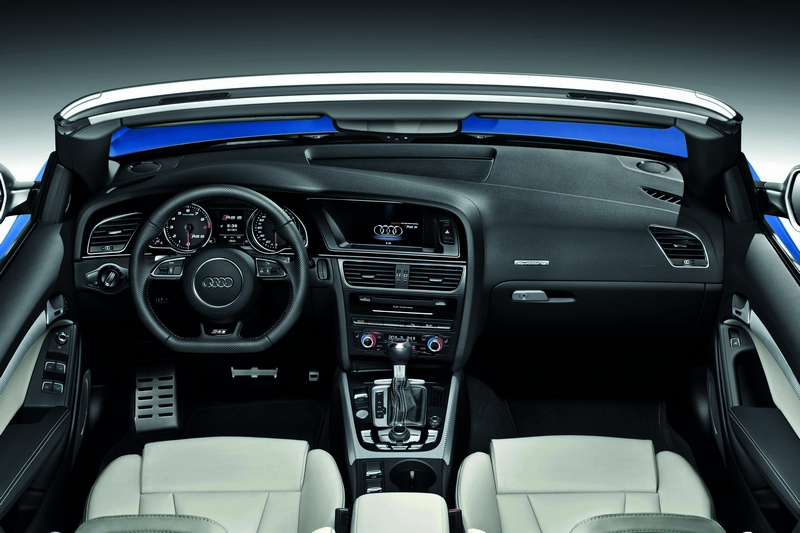 Audi drive select is a standard feature in the RS 5 Cabriolet. The driver can use this function to vary the characteristics of the steering system, seven-speed S tronic, throttle valves and exhaust system sound flaps to one of the modes comfort, auto or dynamic; if an MMI navigation system is installed, the ‘individual’ mode is also offered. The sport differential, adaptive cruise control and dynamic steering – whose gear ratio can be varied by nearly 100 percent as a function of vehicle speed – can also be incorporated into the system. Another option that is controlled by Audi drive select is sport suspension plus with Dynamic Ride Control (DRC) – a purely mechanical system that operates without any delays. Each pair of diagonally opposing shock absorbers is interconnected via hydraulic oil lines and a central valve; when cornering at speed, the system increases support of the spring-deflected front wheel at the outside of the curve. The shock absorber characteristic can be adjusted over three levels. 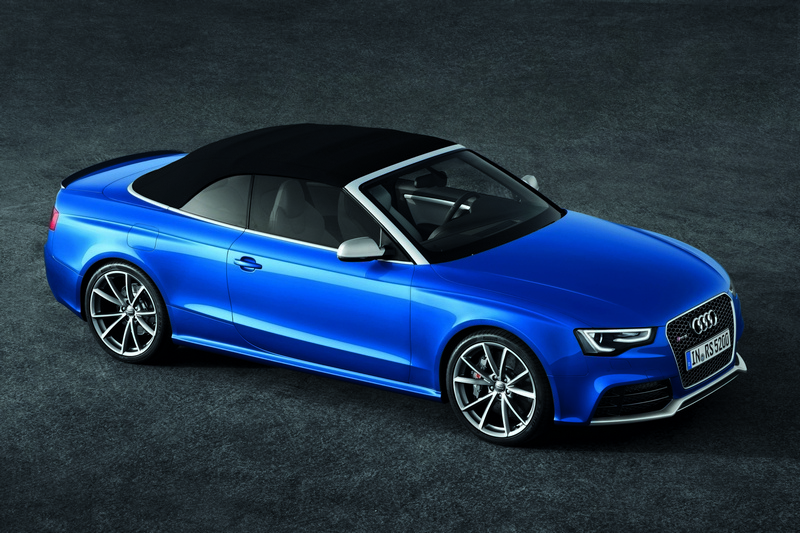 The Audi RS 5 Cabriolet is delivered with an extensive set of standard features. They include the parking system plus, driver and front passenger seat heating, automatic belt feeder, wind deflector, lighting package, driver information system with rest recommendation and a comprehensive package of restraint systems. In case of an impending roll-over accident, strong aluminum plates deploy upwards behind the rear head restraints. Sporty and luxurious options include three-stage head-level heating, convenience key, high-beam assistant, adaptive light and three-zone deluxe automatic air conditioning. All assistance systems offered in the A5 model lineup are available as options in the RS 5 Cabriolet as well. Adaptive cruise control maintains the four-seat convertible at the desired distance to a vehicle driving ahead in traffic and supports the driver in braking. At speeds below 30 km/h (18.64 mph), it initiates a full brake application in an emergency situation. Audi side assist monitors the space behind the vehicle, which helps to ensure safe lane changes. Audi active lane assist makes it easier to stay in a driving lane. The parking system plus can be extended to include a reversing camera. In the multimedia field, Audi is offering a comprehensive modular component system; at the very top there is MMI navigation plus which includes a large hard drive, DVD drive and seven-inch color monitor. An ideal complement is Audi connect with car phone, which connects the RS 5 Cabriolet to the Internet. Audi connect lets passengers freely surf the web with their mobile end devices via an integrated WLAN hotspot. Customized online services from Audi connect are also available to the driver – they range from Audi traffic information online to navigation with Google Earth images and Street View. 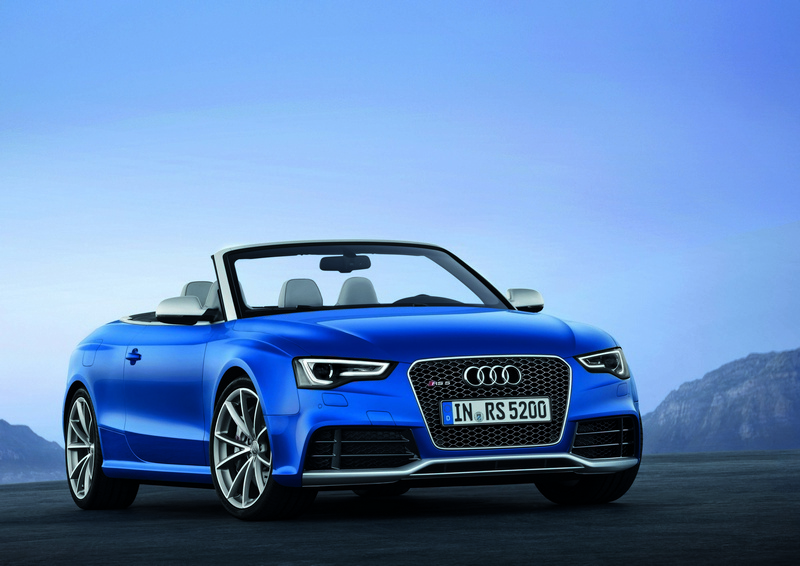 Customer deliveries of the Audi RS 5 Cabriolet begin in early 2013 in Germany. The base price in the home market will be 88,500 euros.